Clarke McRae Williams was stunned. He was just back from serving his country in World War II. 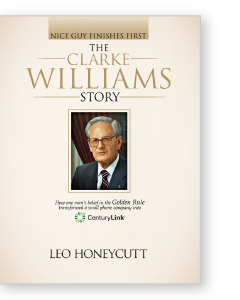 Despite obstacles, Clarke Williams built a tiny bankrupt telephone company into America’s telecommunications giant CenturyLink® on one simple belief: If you treat others as you would like to be treated, you will soon have legions of loyal employees and customers who will build with you. Harvard, Wharton, Stanford and all business schools teach logistics but seldom leadership. This book identifies what this is, that while it takes charisma to get the right things, it takes courage to do the right things. Before you step into uncharted territory, let this roadmap show you how to arrive at a place better than you thought possible. 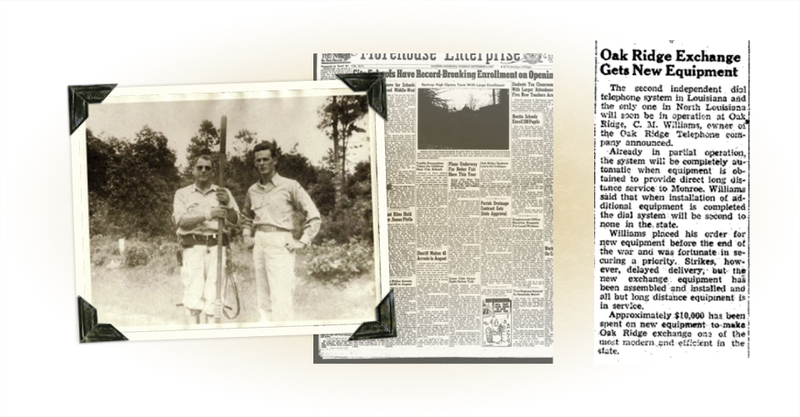 Clarke Williams’ parents gave him Oak Ridge Telephone when he came home from World War II. Less of a gift than an albatross, the haphazard jumble of wires tacked to trees and fence posts served 75 customers and never made a profit. Very few believed he could turn it around. The bank refused his first loan after his banker died just as new equipment arrived. He was too insignificant for underwriters and investors and too small to get even a small business loan. Backed into a corner, he prayed for an answer and within minutes a local farmer drove up offering to invest. Despite installing the second most advanced system in the state, Clarke Williams still had to climb poles in sun and sleet at all hours. He still worked second jobs to meet payroll and keep phones working. His family answered the switchboard in their living room. Suffocating loan payments kept him awake at night and he learned to trust in the God of his youth by realizing the Bible was a roadmap. If he were to call himself Christian, he would be one with courage, especially the courage to put others first. The twist and turns of Century Telephone became a legendary string of miracles. That’s what this book is about: Miracles, second chances and roadmaps. Does religious faith have a place in business? Is the expression "just business" a veiled excuse to win at all costs? 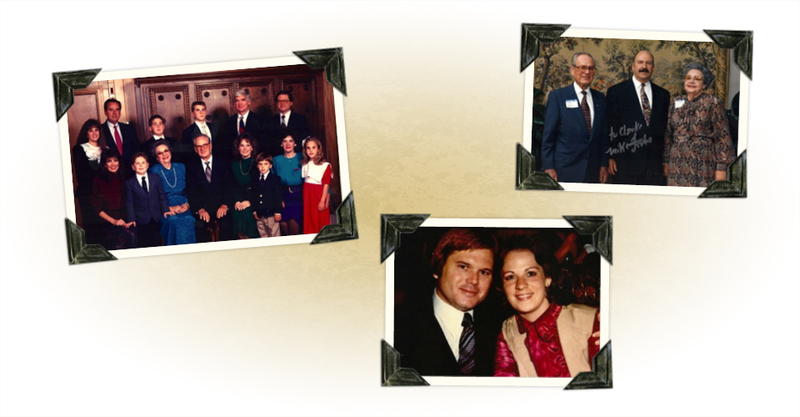 Clarke Williams thought building a company and a legacy on sound spiritual principles was the only way. Against all odds this David in AT&T’s Goliath world today is CenturyLink®, the third largest telecom in the United States. Mr. Williams took the simple principle, Treat others as you would like to be treated, and turned it into a $20 billion success story. He proved the paradox that if you put the interests of others ahead of your own, you are rewarded beyond your wildest dreams. Here and in Heaven. 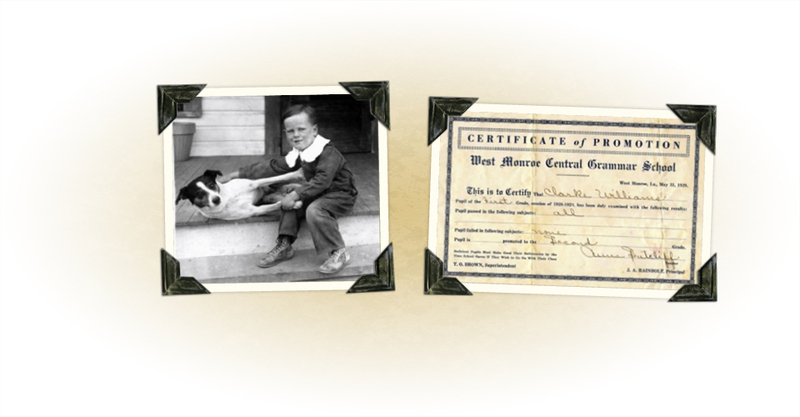 Clarke McRae Williams, next to his father, was born February 6, 1922, after Will Clarke and Marie moved to West Monroe, Louisiana. 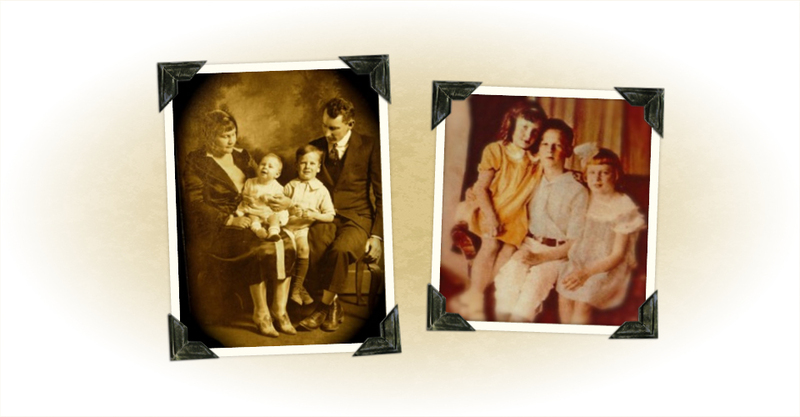 Kittie Marie, in Marie’s lap, was born four years later in 1926. Mary Lee was born in 1927. Will became a payroll accountant for Cumberland-Southern Bell Telephone in Monroe and, after the 1929 Stock Market crash, he moved the family to Oak Ridge, Louisiana, buying Oak Ridge Telephone Company for $500 from the Hogan family. Clarke Williams at four years old with his dog Sweetie at home on Natchitoches Street in West Monroe. 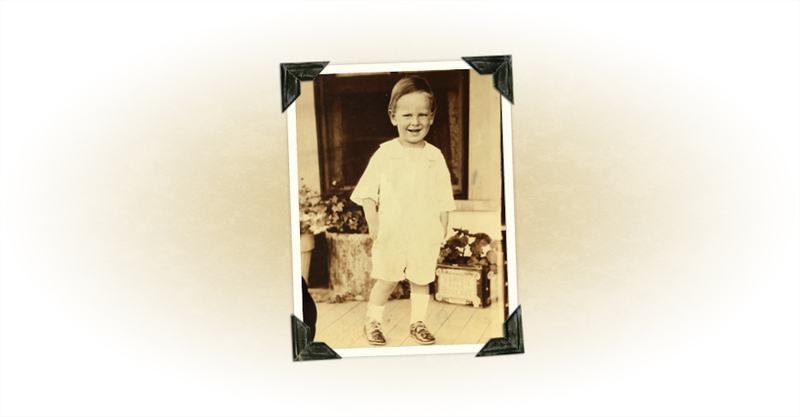 He began school in 1928 at West Monroe Central Grammar, renamed Crosley Elementary, while his father walked across the Ouachita River on the Desiard Street Bridge into downtown Monroe to work at the Southern Bell switchboard office. The winning Clarke Williams smile already. 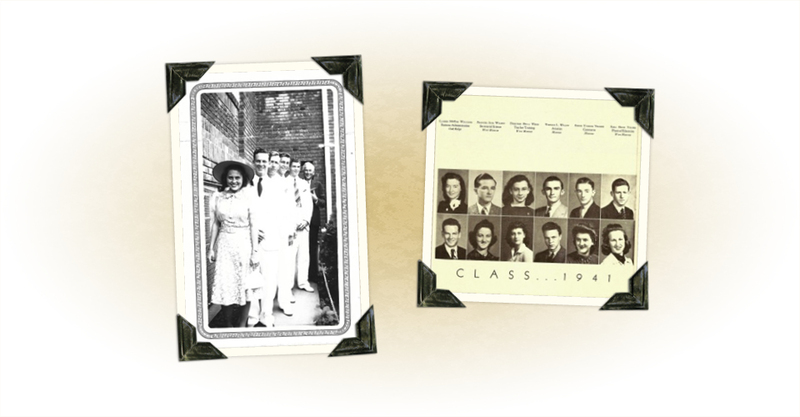 Oak Ridge High School Class of 1939. This is the entire graduating class. (Front to back) Nellwyn Grier, Clarke, Jack Norman, Arthur Bernard Carroll, Douglas Wathan, Reverend Winn. Northeast Louisiana State College Class of 1941. While most of Clarke’s friends went off to school, he paid his way by chauffeuring others from Oak Ridge to Monroe. Sixty years later, Northeast Louisiana University would award him an Honorary Doctorate of Arts, only the eighth one in the university’s seventy-year history. Clarke joined the U.S. Army Air Corps in 1942. Though he paid for initial pilot training, the Army would not let him fly because of an elevated heart rate. 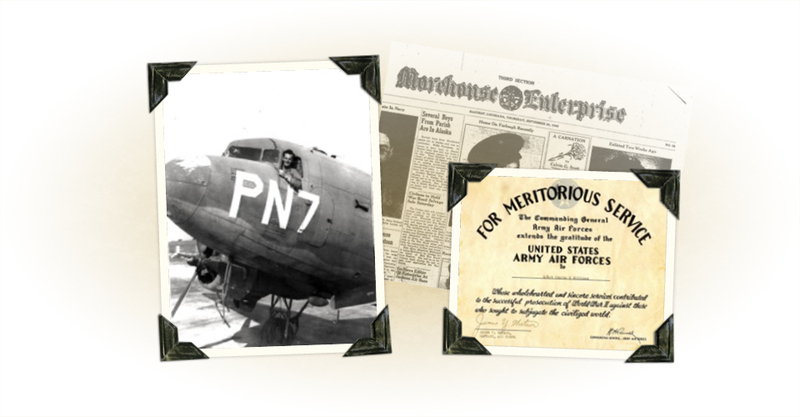 He worked on B-25 engines, fuselage, armament and weaponry at bases from Florida to Los Angeles to Washington State. Much to his chagrin, not only was he denied his dream of being a pilot, the Army kept him stateside while most of his friends fought in Europe. Clarke met Mary Kathryn Lee while on furlough in Oak Grove, Louisiana. Theirs was love at first sight that lasted a lifetime, though Mary Kathryn worried about incurring more debt to float Century Telephone. They married in Oak Grove on July 21, 1946. 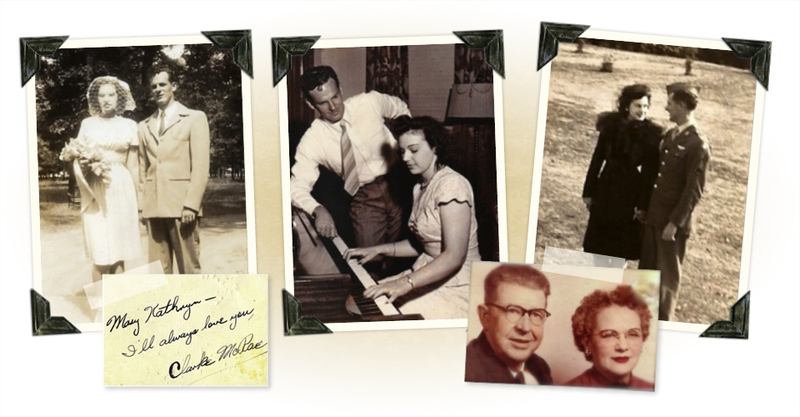 Mary Kathryn’s parents were Ola Mae and entrepreneur Roy Lee. Roy became Century Telephone’s second investor behind Joe Sidney Carter of Oak Ridge. 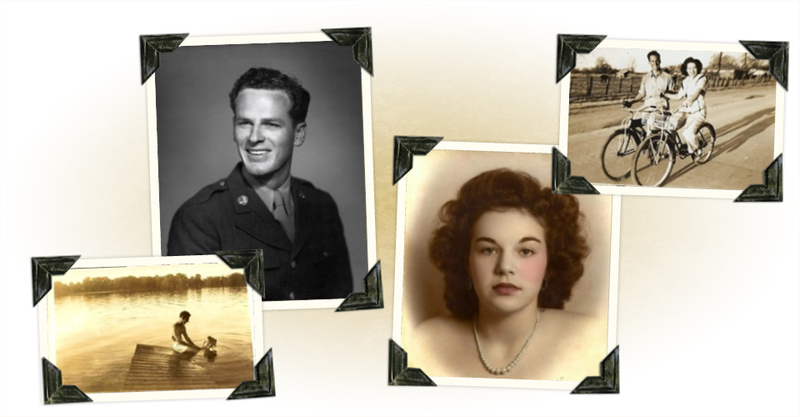 Will and Marie Williams “bequeathed” Oak Ridge Telephone Company to Staff Sergeant Clarke Williams and Mary Kathryn as soon as Clarke came home after the war. In reality, the company was an albatross, a haphazard jumble of wire strewn across the countryside on barns, trees and fence posts. Will worked for the Oak Grove Power Company and kept the phone company running while Clarke was gone. Once back, Clarke had no choice but to modernize. Oak Ridge became only the second Louisiana town to get rotary dial telephones. 1. Clarke Williams’ early management team for Central, later “Century,” Telephone: Buddy Payne, left, and Seth Arnold. 2. Century’s early board, anchored by financial genius Walter Frank, far right. Behind Clarke Williams, left to right, are Seth Arnold, Mark Maurer, Marvin Hill and Ken Conrad. 3. Clarke brought the Williams family back to Mississippi by buying Mount Bayou Telephone from the Huddlestons in Bolivar County. 4. 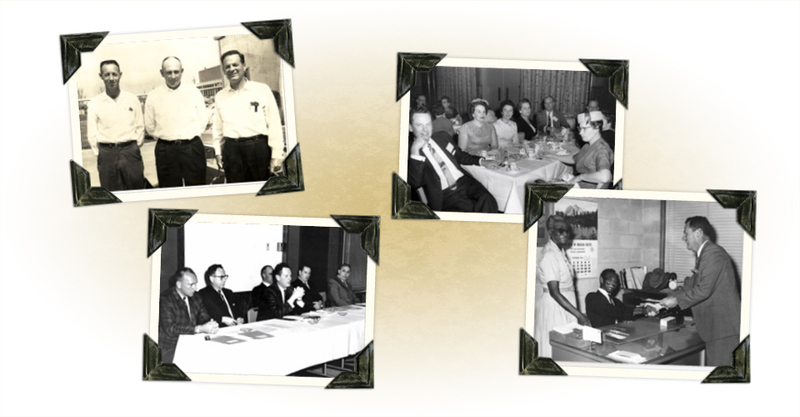 Clarke Williams joined every independent telephone owners’ professional organization and rises to lead the Independent Telephone Pioneer Association. With him at the 1956 New Orleans convention are, left to right, Mary Kathryn, sister Mary Lee Williams Wasson, mother Marie Hill Williams, and across the table is his right hand at the Marion, Louisiana, exchange, Etta Stripling. Clarke became a convention favorite and when other independent operators wished to sell their exchanges, Clarke Williams was their first and last call. To each he said sincerely, “If this is not a good deal for you, I don’t want to do it.” He built Century on the Golden Rule and instilled that in management. Clarke Williams refused to listen to critics. The Army may have grounded him but he soon finished his own pilot training, passed the exams, and the F.A.A. issued him a pilot’s license. He and Walter Frank flew everywhere to assess and buy phone systems as soon as the exchanges went on the market. Occasionally, his mother Marie, the former Mertzon, Texas, telephone operator, would tag along. 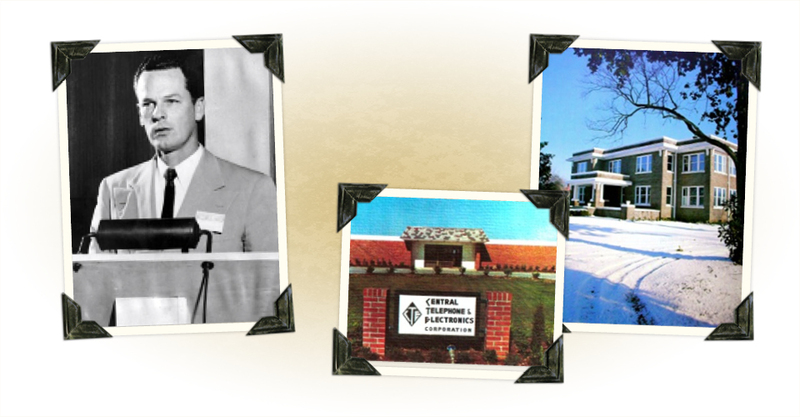 Central Telephone & Electronics first headquarters was built in Marion, a small town in Union Parish, Louisiana, bordering Arkansas. 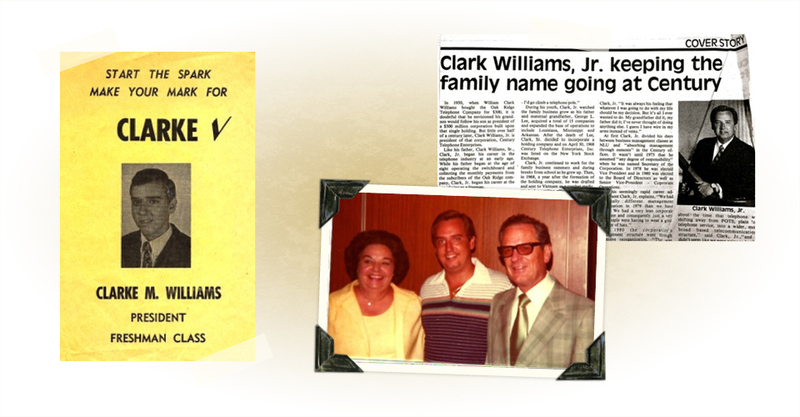 Clarke Williams at 27 convinced Marion residents to let him acquire and improve their phone system. He moved his parents there to run it. 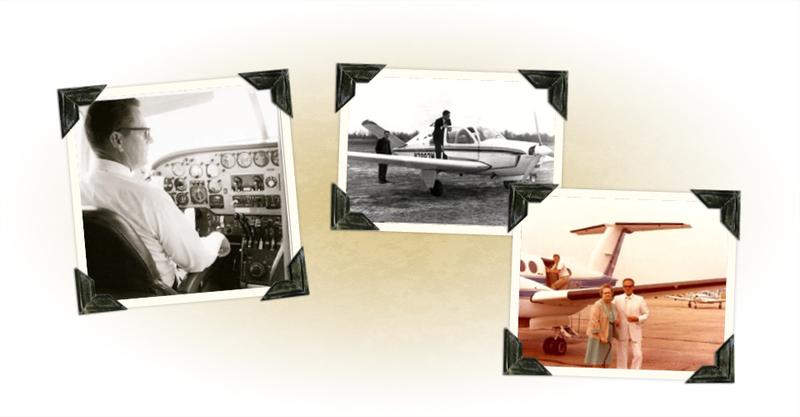 Century Telephone & Electronics first moved to the Monroe (Louisiana) Airport then to Riverside Drive. As Clarke and Walter acquired more telephone systems, CTE soon outgrew this location and expanded to two more buildings. Clarke was in constant demand to speak even though most Louisianans, even in Monroe, had never heard of his company. 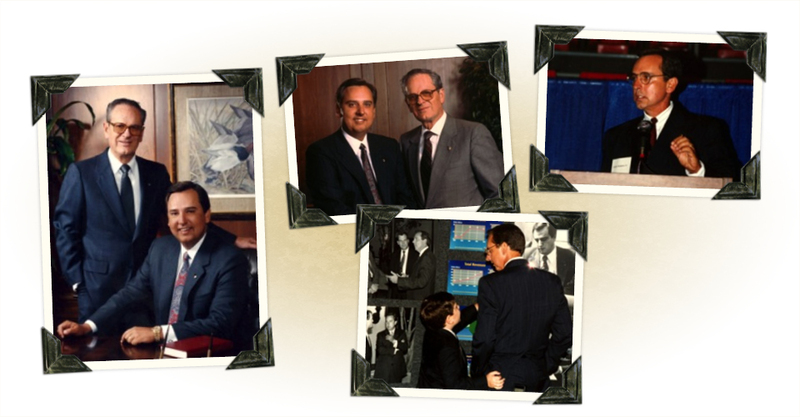 Clarke Williams moved to the equity markets in 1968, first trading on the Over the Counter exchange with the ticker symbol “CTE.” (Left) CTE’s first annual report. 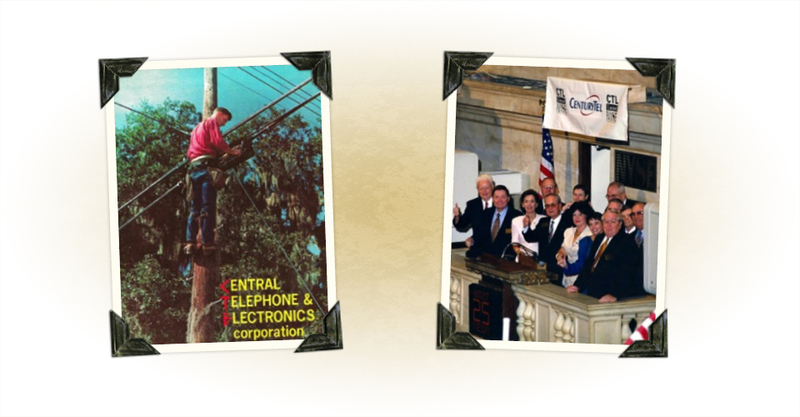 In 1978, Century Telephone began trading on the New York Stock Exchange with its current symbol “CTL.” Prior to trading on the exchange, Clarke and Mary Kathryn Williams had never owned a share of stock, but they much preferred paying investors instead of paying interest. Clarke Junior shows early leadership by running for student council president in his freshman year at Louisiana Tech. By the end of the first year, he was drafted into the U.S. Army to deploy to Vietnam in 1969. At the time, the country was divided by war protests from coast to coast and Clarke Junior, often rebellious as a teenager, asked not to go. “The Army will do you good, son,” his World War II veteran father told him. Clarke Junior’s stint in Vietnam would later prove catastrophic for the family and for Century Telephone. Clarke McRae Williams, Jr. started as a lineman in his 12th summer. To the delight of his father, he chose to rejoin the company when he came back from Vietnam, rising to the presidency of Century Telephone in 1983. Among the first to recognize the impact of cellular technology, Clarke Junior plunged Century into the mobile phone business, doubling the company’s assets. He was a favorite of Wall Street analysts, but barely into his presidency, Clarke Junior developed Hodgkin’s Disease, a result of his exposure to Agent Orange in Vietnam. He underwent chemotherapy and in 1989 suffered a debilitating stroke. His mostly-retired father and the board made the heartbreaking decision to retire Clarke Junior from the company. Clarke Williams Jr. died in 1994 at age 44. In the last photograph, Clarke Junior is recounting his life to son Clarke McRae “Trey” Williams, III, at an exhibit at Century’s annual shareholder’s meeting. All in the family. Attorney Harvey Perry married Carolyn Williams and soon his brother-in-law Clarke Junior asked him to join Century Telephone as Chief Legal Counsel. With Louisiana Governor Murphy J. “Mike” Foster during his 1999 reelection. largest telecommunications company in the United States. Copyright © 2014 The Lisburn Press. All rights reserved.